A leafy shoot from a node or bract found on scapes of many cultivars. 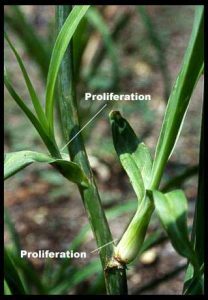 Proliferations may be rooted to form a plant (clone) identical to the mother plant. Small roots often form and occasionally a flower is produced while the proliferation is still on the scape. In the image below the upper proliferation has formed at the bract. Read Lee Pickles’ article: Proliferations…My Way.